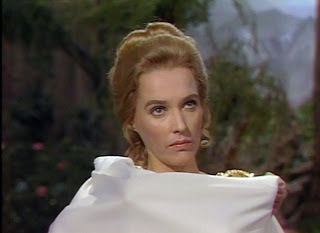 The fifth episode of the third (and final) season of the NBC Saturday morning series highlights the mythological Medusa -- snake-haired Gorgon (sister in myth to Euryale and Stheno) -- as the villain of the week. And indeed, if you are familiar with this bicentennial-era series, it may sound like a real stretch that the Gorgon Medusa would appear in the "closed" pocket-universe of the Land of the Lost. But 1976 was a year of significant format alterations for this series, as we've seen in the preceding weeks. Specifically, star Spencer Milligan -- playing Dad, Rick Marshall -- left the program. On screen, Ron Harper (Planet of the Apes) took the lead as Uncle Jack, and behind the scenes, Sam Roeca, a veteran of CBS's animated Valley of the Dinosaurs, came aboard as writer and story editor. Also, writer/producer Jon Kubichan joined up. Roeca was on the same page in these desires and shared a mutual enthusiasm for mythology with Kubichan. Together, the new team sought to present in each third season installment "something from the past, from some literature or children's narrative." "A writer that I knew came in, Greg Strangis, and came up with his story. He said, 'How'd you like to do a Medusa story?' and I thought it was a good idea. He went home, worked out a story, and I made some changes. He re-wrote a little, and that was that." In "Medusa," Holly (Kathy Coleman), Will (Wesley Eure) and Cha-Ka (Philip Paley) are busy preparing a sort of emergency canoe on the river that the Marshalls explored in first season's "Downstream." Holly boards the craft, and when a dam down-river breaks, she end ups hurtling away from the others. 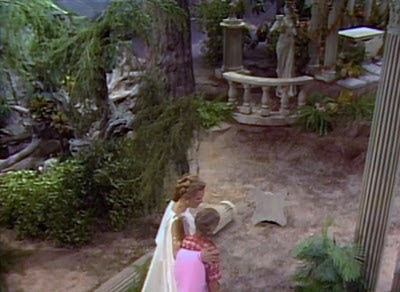 She is rescued by a mysterious woman named "Meddie" (Marion Thompson), and escorted to Meddie's "Garden of Eternity." 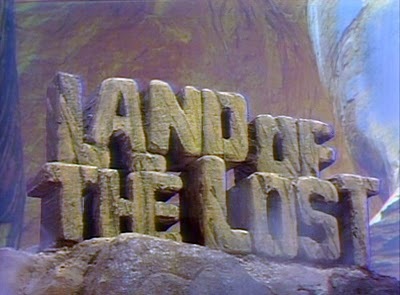 Today, Land of the Lost's dedicated sense of creative imagination and fantasy far outstrips the production's prehistoric special effects, which have not aged gracefully. The series is still incredibly enjoyable (the effects are no worse than Dr. Who's; or Blake's 7, for instance...), but "Medusa" is nonetheless hampered by some poor visualizations. For instance, when "Meddie" turns into the Gorgon, it's clear that the snakes in her hair are just rubbery, inanimate, life-less things. And her gray, monstrous face make-up doesn't extend fully down her neck. In other words, you can see clearly where the make-up stops and real flesh color begin. 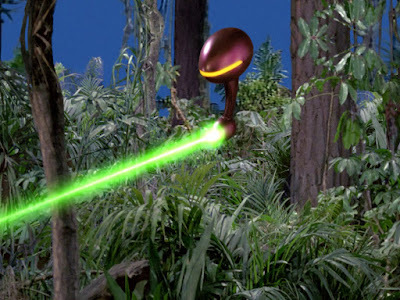 But again, Land of the Lost remains a really terrific Saturday morning's kid show because it is so endlessly imaginative, and because many episodes tend to concern great concepts, whether from science fiction (like time-loops, for instance) or from mythology. Greg Strangis's fantasy story is actually grounded in reality too, and has two very notable themes. In a very real way -- and this is probably why this episode was so frightening to children at the time -- the episode concerns our childhood fear of strangers. Here, Holly is alone and taken in by an apparently kind adult, but one with secret motives. She tries and tries to get away, but the adult is both demanding and apparently friendly simultaneously, and, well, it's hard for kids to go against the wishes of an adult. Here, the stranger is indeed a monster, and Holly must plot her escape carefully. So the story here, in veiled terms, is -- watch out for strangers. The other sub-text in "Medusa" surely concerns vanity. "Meddie" is ultimately undone by her narcissistic obsession with her physical beauty. According to the teleplay, it is actually "ugly" to be too concerned with one's self. As Holly notes at the end, the problem with vanity is that you might -- like Medusa -- get "trapped" by it. 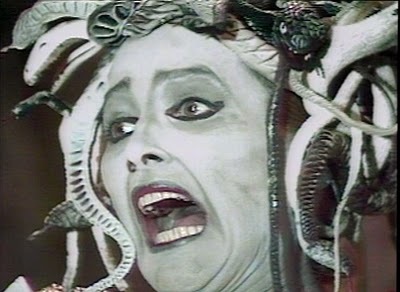 As a six-year old kid, Land of the Lost's "Medusa" terrified me to my core, but it wasn't just the Gorgon's appearance and frightening ability to turn people to stone that was so powerful; it was the idea that she was a dishonest, untrustworthy adult who was planning to do monstrous things to an innocent child. Yikes...now that's disturbing in a real life way; a way that, well, dinosaurs or Sleestak are not. Today, it's probably hard to conceive that an innocuous Land of the Lost from the disco decade was ever something that was legitimately "scary." But even today, you can detect how the series always attempted to ambitiously present a lot on a very small budget. For instance, "Medusa" features one or two very impressive high angle shots of Medusa's lair. These difficult-to-stage angles get across the atmosphere of danger and dread in a powerful way. A kid's show in a hurry likely wouldn't have found the time to pick out the right angle in moments like these, but Land of the Lost remains powerful (especially to the young-at-heart...) because its stories were conveyed with care both on the page and on the stage. John, good review of "Medusa" episode. As a boy on '76, I was happy to see statues of Jefferson Davis Collies and Sarah for the reason you stated. It builds of the history of the first two seasons. However, I was sad to think that Jefferson had been turned to stone!